New steps forward now possible for India’s lions? After decades of political debate, it is now possible that a small number of India’s lions will be translocated into the Kuno wildlife reserve. This offers a major opportunity to expand the population away from the high density situation currently apparent in the Gir forest in Gujarat (which is currently surrounded by highly populated rural landscape). A translocation was prrevioulsy attempted in 1957 in Chandrprabha Sanctuary, Uttar Pradesh but failed due to lack of follow up, monitoring and management. The Kuno Sanctuary itself was first surveyed in 1993-4 as part of an assessment of possible additional habitats for lions. It provides a chance to have a second wild population kept clear of the Gir population as an insurance against unforeseen threats, such as infectious disease. Venkataraman (2010) suggests two ways of optimizing the natural dispersal of lions, either (i) adaptive population management within the satellite habitats by translocating and active management of the sub-poluations or (ii) facilitating the corridors for natural dispersal. A new population in Kuno would represent option 1. 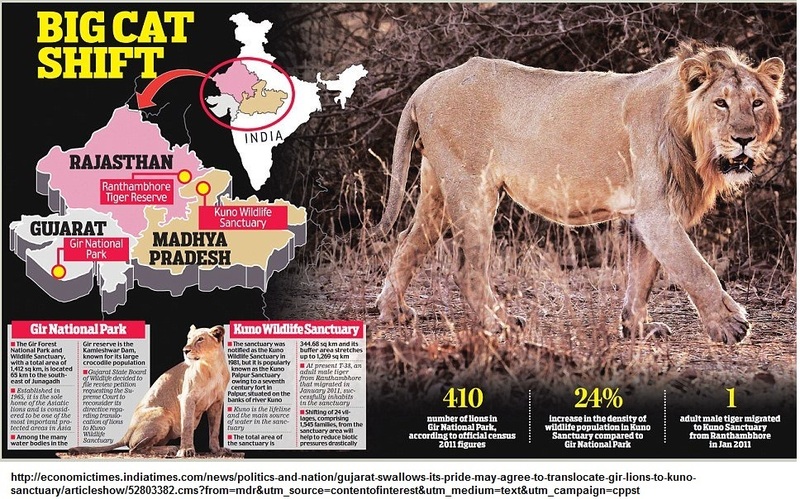 A future Kuno population would be mamnaged alongside existing sub-populations which have already dispered into areas outside the Gir forest including coastal areas to the south, Girnar Wildlife Sanctuary (WLS), and hill ranges extending from MitiyalaSavarkundla-Palitana-Shihor towards the Junagadh, Amreli and Bhavnagar districts of Gujarat. The coming years will be an interesting time for active conservtion management of lions. Divyabhanusinh, C. (2005) The Story of Asia’s Lions. Marg Publications, Mumbai, India. This entry was posted in Conservation and tagged India, translocation on July 13, 2016 by Simon Black.